The number of women members of parliament in the Arab world has almost doubled in the last five years, according to a new report. The International Parliamentary Union (IPU) said 6.5% of the region's MPs were women, compared with 3.5% in 2000. Jordan, Tunisia and Morocco contributed most, but the trend should continue thanks to the recent Iraqi elections. But the region is still well below the world average, with several Gulf states having entirely male parliaments. 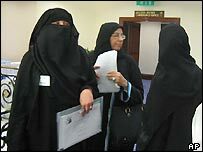 The report comes as Saudi Arabia holds the second stage of its local elections, in the east of the country. Women have been completely denied the right to vote. The survey showed that the proportion of women MPs throughout the world had risen from 13.4% to 15.7%, crossing the 15% mark for the first time ever. Rwanda topped the list with women making up 48.8% of its lower house of parliament, and Sweden came second with 45.3%. Sweden also had the most women ministers - 52.4%, followed by Spain with 50%. Of the 58 countries which held lower house elections in 2004, 49 showed an increase in the numbers of women. The biggest increases were in Belarus, followed by Tunisia, Niger, Uzbekistan and South Korea. All four countries have some degree of affirmative action at parliamentary or party level. But the improvement is still far short of gender parity, the IPU says. At the current rate, it would take 20 years to reach 30% of parliamentary seats throughout the world and 35 years to achieve parity. "I am not at all sure that either women or men will want to be that patient," IPU secretary general Anders Johnsson told AFP news agency. How democratic is the Middle East?